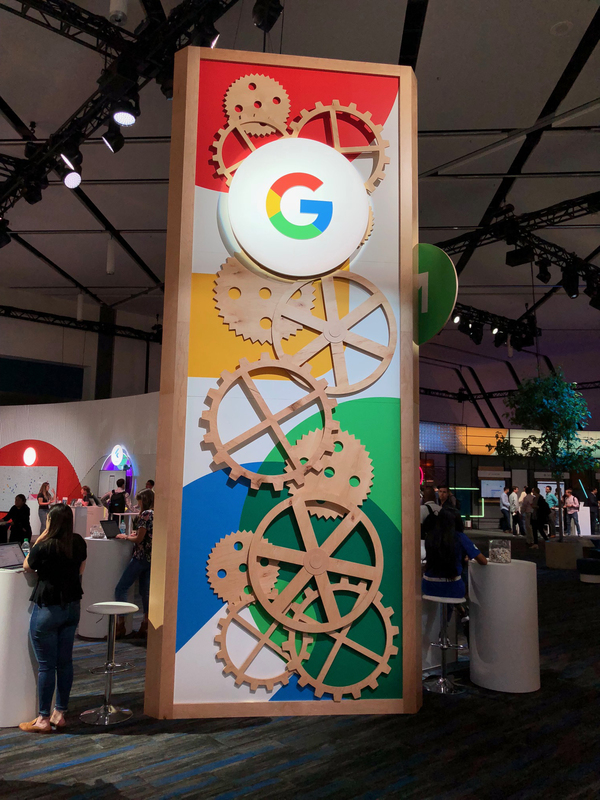 This July was Google's biggest ad industry summit of the year, Google Marketing Live. I had the pleasure of traveling to sunny San Jose to fully immerse myself in the wacky world of the Googleplex. This year's marketing live was all about Google combining platforms and making their tools talk to each other more. From an advertising perspective you'd be hard pressed to find a company that knows more about who you are and how you behave online. Google's reach also extends far beyond the ad world, and that was part of the event too. Google Home was heavily featured as evidenced by the popular keynote and the "Age of Assistance". Themes like Assistance, Automation, Smart and buzzwords like Valuable, Transparent, Trustworthy, Machine Learning were swirling about. What new Google tools we can use to make our clients more money! Here are 5 product announcements that we will use to make you more money. 1. 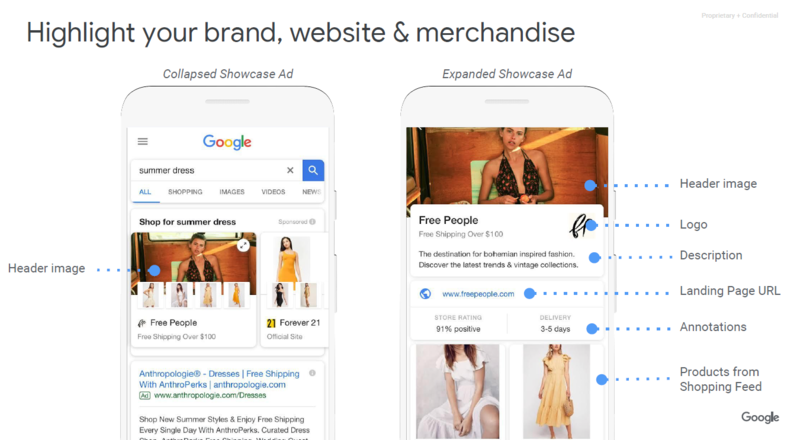 Responsive search ads (currently in beta) - Google introduced responsive search ads which combine machine learning with variables that we input to dynamically generate the perfect ad. More space: Show up to three headlines instead of two, and up to two 90-character description fields (instead of one 80-character description field). More flexibility: With up to 15 headlines and 4 descriptions for a single responsive search ad, there are many possible combinations for Google to show depending on the query. Why does it matter? This changes the game with how ad copy is handled. The fact that Google is giving so much more space to these ads means that early adopters can win big with 5%-15% higher CTR. 2. Shopping showcase ads. As Google matures as a platform finding ways to fuse storytelling and shopping in the way Facebook and Instagram do is increasingly important. I love Google Shopping for ecommerce brands because of how visual the platform is. For those brands that have more engaging assets, these Showcase ads let brands take it one step further to create a rich ad unit that blends lifestyle with shopping intent. Why does it matter? Luxury and D2C brands often struggle to communicate their value visually on the Google SERP. This tool gives brands with savvy agencies a way to differentiate, especially on valuable mobile real estate. 3. 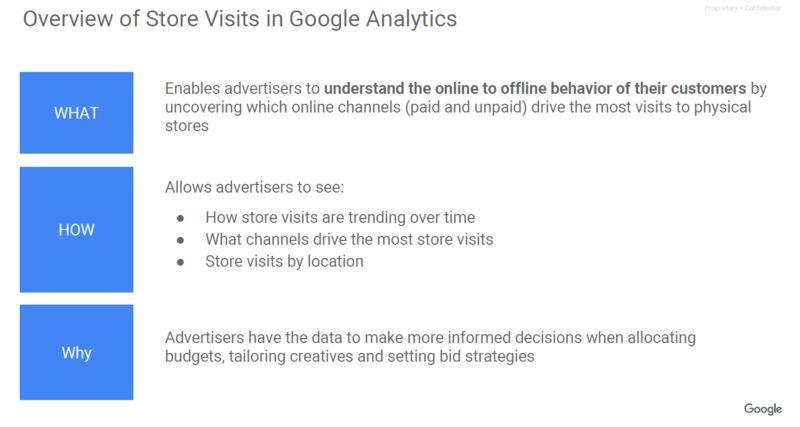 Google Ads & Analytics Local Store visit tracking. It's an omni-channel world baby! We know there's crossover value between online campaigns and offline visits. Google has unveiled 2 new tools to track this, one within Google Ads and one within Analytics360 (aka Premium). It's good to see Google unleash some of this power within Google Ads, but the fact that it's only available in the premium version of GA is disappointing. Why does it matter? Online -> Offline is one of the most frequent topics of strategy and is already a strategic focus for a number of our clients. This tracking will help us put more concrete numbers to the value of those initiatives and further build this practice. 4. Trueview for Shopping (i.e. Shopping ads in YouTube). Running ads on YouTube is nothing new. Even Google Shopping ads. But it's been hard to take the platform seriously as a direct response performance marketer because the connection to driving to the site has been lacking. Google is finally recognizing that brands don't want to pay money just to show people videos and drive them to more YouTube videos. The call-to-action overlays are improving with more ability to drive to site (rather than YouTube, which used to be the priority), you don't need a video asset to run these ads. As a direct response marketer, I welcome this functionality and need Google to keep introducing new tools to execute full funnel performance marketing. Why does it matter? Video is hot right now and combined with Custom Intent targeting there's a way to leverage all of Google's data to channel intent. Going full-funnel and creating demand for a brand or product - as opposed to just capturing demand - is something that Google has pushed for YouTube for some time. This further refinement finally puts YouTube into more serious consideration as an essential tool for all performance marketers. 5. Custom Intent Audiences . Not totally new, but with new features that I expect Google to continue to improve. These audiences can be layered on top of any Google Ad Type: YouTube, Search, Shopping & Display. What I like so much about these is, Google is finally figuring out how to tie together the signals across all of their properties. If you take a step back and really think about that, it's extremely powerful. *What you search, watch on Youtube, say in Gchat, read in Gmail, webpages you browse in Chrome, what stores you go to on Google Maps, all of that is potentially used by Google to determine the things you're into. *Disclaimer - Google did not say that they actually use data from all of these sources, I'm making assumptions as to what could power these audiences. All data is also anonymous to us marketers. Why does it matter? We have a powerful tool to target highly qualified audiences on upper funnel media that is simultaneously launching new shopping capability. Think YouTube, Shopping, and Google Display. Landing page speed score pulled into Adwords. Pagespeed is one of the most important drivers of mobile conversion rate. Google is making it easier to see those scores at a glance within Adwords, so we can make more proactive recommendations. GA cross device reporting & remarketing lists. Before Cross-Device reporting, if a customer visited your site from their desktop and then from their phone, those sessions wouldn’t be correlated in Google Analytics. Now, with Cross-Device reporting, you can track visitors’ paths across all devices. Shopify Integration. It's good to see Google announcing and pledging support to Shopify, given its importance as an ecommerce platform. Google Shopping feed app within Shopify: This isn't new, but hopefully they've made it more functional and flexible. The old app was borderline the worst thing I've ever used, so any improvement is welcome. Manage campaigns within Shopify: I don't anticipate this being useful for Metric Digital clients because scaling on Google requires expert, hands-on management. But for the new Shopify business that isn't yet ready for an agency, this should make it easier to build momentum. Smart Campaigns: Especially a new Smart Shopping campaign. This isn't specific to Shopify, but ties together with the general theme of where Google is focusing. Automated shopping feeds. Google will crawl your site and build your product feed dynamically. This could be a huge time, money, and headache saver for lean ecommerce operations. It's not likely to go live until 2019, so don't get too excited just yet. Finally, what was missing (somewhat conspicuously)? Gmail ads. These were big about a year ago. We had several clients spending five figures monthly driving ROAS comparable to Search & Facebook ads. Until Google changed their algorithm. It appears these are not an area of focus for Google, likely due to privacy concerns. I only noticed Gmail mentioned as one of the places ads can serve from Smart campaigns. Google Display network. There were updates on purely automated display campaigns, which we've been hands-on with for a few of our high spend advertisers. But aside from that, I didn't feel the GDN was much of an area of focus. More attention was given to the programmatic side of the house, formerly DoubleClick Bid Manager. Facebook. You'd think Google would talk about their biggest competitor in the ad world, right? Or at least acknowledge that they exist.? I heard the words "social media" mentioned twice. Interesting. That's our quick recap. Many of these new features are still in beta, but if you're a current client look us to be testing them very soon. If you're not a current client yet then ask your agency if they're planning to test these tools, otherwise you might be getting left behind! Are You Making These Mistakes On Your Shopify Store? Let's explore several common mistakes that ecommerce business owners make and how to avoid them. Find the ideas that work best for your store, and you’ll be well on your way to achieving your business goals. The Two Types of Badvertising (And How to Know If Your Company Is a Victim) Badvertising is a complex issue. 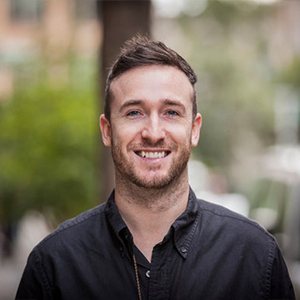 Based on our experience, there are two main categories within the digital marketing industry. We’re going to break them down, along with several case studies of how they play out on a day to day basis. Maximize Holiday Revenue on Black Friday & Cyber Monday with Google Promotion Extensions Just in time for the holidays Google has brought Promotion Extensions out of beta and available to all accounts as part of the new Adwords Experience! When combined with Google Shopping Promos this is a powerful one-two punch that will make communicating promos this holiday season more effective than ever.